It even comes with its own Space Elevator!note Until it got destroyed, anyway. Post-Cyberpunk picks up where Cyberpunk left off. Whereas cyberpunk is/was a Darker and Edgier riposte to older Science Fiction, intended to portray what might happen if we don't all destroy ourselves, Post-Cyberpunk is intended to present a less pessimistic and more realistic vision. Where Cyberpunk is anti-corporate and anti-government, Post-Cyberpunk is willing to give both parties redeeming features. Where Cyberpunk portrays the future as a Crapsack World, Post-Cyberpunk posits society will probably be about the same, just with cooler gadgets and Crapsaccharine World aspects. Where Cyberpunk is futuristic, forward thinking and on the cutting edge... so is Post-Cyberpunk. Post-Cyberpunk is the reaction to the Darkness-Induced Audience Apathy of Cyberpunk. Of course, Postcyberpunk involves reconstruction of concepts Cyberpunk deconstructed, or deconstruction of Cyberpunk Tropes (such as the Dystopia). The Cyberpunk genre itself was meant as a reaction to utopian fiction popular in the 1940s and 1950s while exploring technology's possibility for abuse 20 Minutes into the Future (tech from Star Trek will just result in Brave New World), but as the genre itself got so Darker and Edgier to the point of being just as unrealistic, it was predictable that Cyberpunk itself would get a deconstruction. What the old and new Cyberpunk genres share is a detailed immersion in societies enmeshed with technology. They explore the emergent possibilities of connectivity and technological change. What Post-Cyber Punk has that separates it from pure-Cyberpunk works, is an emphasis on positive socialization. In Lawrence Person's "Notes Toward a Postcyberpunk Manifesto" he describes typical Post-Cyberpunk protagonists as "anchored in their society rather than adrift in it. They have careers, friends, obligations, responsibilities, and all the trappings of an 'ordinary' life." For this reason, character goals also differed characteristically, "Cyberpunk characters frequently seek to topple or exploit corrupt social orders. Postcyberpunk characters tend to seek ways to live in, or even strengthen, an existing social order, or help construct a better one." In other words, there is a notable absence of 'punk' elements as found in most other Punk Punk genres. And in recent years several works that rely heavily on the post-cyberpunk conventions and tropes and have a strong post-cyberpunk atmosphere managed to drop most of the 'cyber' aspects as well. (see Inception and Mirror's Edge as examples.) Just like it's mentioned in the Cyberpunk article, Post-Cyberpunk heavily deals with Social sci-fi in accordance with Asimov's Three Kinds of Science Fiction, but its portrayal of technology is more neutral than Cyberpunk's, and sometimes it's downright positive. While Cyberpunk focused on technology going beyond our control and dooming us all, Post-Cyberpunk states that HUMANS cause technology to go awry, and that responsible use of technology could actually bring us to a new age. Simply put, Post-Cyberpunk basically reins in Cyberpunk's excess and tries to give us a more open vision of the future. Aside from this main difference, the two sister-genres share many themes, tropes and story elements to the point that many question the legitimacy of this genre as separate from Cyber Punk, and contend that Post-Cyberpunk is simply Cyberpunk expanded beyond its base and taken further logically. Purists, however, see a definite difference. The Post-9/11 ideological atmosphere of 21st Century America also saw a marked decrease in heroes who were decidedly anti-establishment. Despite the dystopian nature of cyberpunk settings, it was frequently assumed that race, gender, nationality, and sexual orientation would be non-issues in the future, the rationale being that the last generation that really cared would have almost died out by then (even racially homogeneous Japan is often depicted as a melting pot in the future). However, now that society is in the chronological era that the majority of cyberpunk depicted, issues surrounding identitarian politics are still not only alive, but even more volatile than ever, threatening to make society more divisive. As a result, post cyberpunk is often required to shelve more futurist themes and focus on existing social issues that have carried over from the past millennium. Additionally, it is far more difficult (bordering on impossibility) to operate anonymously or in the shadows outside of the system (the "Punk" aspect of Cyberpunk) or under dual/false identities. The increase of security profiling, monitoring, hidden surveillance and current forensics technology is making it less and less possible to move around without leaving fingerprints or footprints of some type, digital or otherwise. And today, there is now the understanding that there is no anonymity or privacy on the internet. Basically, if you have a Crapsack World modelled on Nineteen Eighty-Four and/or Japanese Zaibatsu where (most critically) technology is a method by which the power elite control the people, and the protagonists are entirely against said society, you have traditional Cyber Punk. If, however, you have a world that has some redeeming features, is not controlled by the State and/or Mega-Corp, technology isn't screwing everything up, and the protagonists are trying to fix social problems from within rather than rebelling against society from without, you have Post-Cyber Punk. Of course, there is plenty of overlap. In Japan, the tropes that would make up Post-Cyberpunk have been a part of their science-fiction worldview since as long as anime have existed, predating Cyberpunk itself. The incredibly influential Astro Boy portrayed technology as having the potential for both great good and great evil from the very beginning, and the Punk Punk elements were largely imported later and were never quite as popular in Japan as they were in the United States. Compare Cyberpunk, Punk Punk and Postsomethingism. See Cyberpunk Tropes for tropes found in Post-Cyberpunk works and shared with its cousin Cyber Punk. Also compare it to Solarpunk; both were created as reactions to these sort of tropes (and thus the oddballs of the -punks,) but Solarpunk takes a more down-to-earth approach and heavy emphasis on ecology. Not to be confused with Post-Punk, which is a music genre based off New Wave Music. Though Appleseed starts with two soldiers scavenging for food in the wake of a nuclear holocaust fighting against gangs of mercenaries, they are soon taken to a city of Crystal Spires and Togas, where they are hired as paramilitary police officers. Ghost in the Shell: Stand Alone Complex straddles the line between Cyber Punk and Post-Cyberpunk. On the one hand, the world is recovering from devastating world wars, while governmental corruption, media control, excessive state security (of which the heroes are one branch of), and social division is at an all time high. Yet at the same time, an ordinary middle class still exists, society and culture have not collapsed into mindless consumerism, and technology is portrayed neutrally. Most of all, the heroes may be ruthless agents, but ultimately are dedicated to protecting their country, even if it means pitting themselves against conspiracies that have emerged from their own government. Japan itself is visually depicted as fairly similar to its modern state (albeit with more advanced technology), rather than being a devastated Wretched Hive. Summer Wars is a shining example of this, what with the fact that a virtual world is the thing that connects everything together. Not to mention the Next Sunday A.D. setting. Dennou Coil, which is best described as "Ghost in the Shell as done by Hayao Miyazaki." Real Drive, which is basically "Dennou Coil as done by Shirow Masamune." Patlabor takes place in this sort of world, though the 'punk' side of things are portrayed to vastly different extents depending on the continuity (manga, TV, film, plus wherever the OVA series fits - but in all cases fairly mildly). The main characters are all police officers, the government is on solid ground, and the corporations clearly answer to it rather than the other way around as would be the case in classic cyberpunk. The only practical difference between then-modern 1988 and the 1998 in the shows are Labors and the Babylon Project that prompted their creation - and compared to other robot anime of the time, that the difference is so minor is astonishing. Perhaps the earliest example of Post-Cyberpunk predates Cyber Punk itself - Astro Boy. It has many of the themes present in Post-Cyberpunk works, where technology causes massive social upheaval and change that is rough, but ultimately good and a symbol of hope as cyborgs and robots experience discrimination, contemplate rebellion - but are ultimately integrated into society. Urasawa's Pluto fits the bill as well, essentially being a Darker and Edgier version of the original Astro Boy. The Digimon series is perhaps an extreme example of Post-cyberpunk characterization. The main heroes are just normal kids with families and friends, who happen to also restore order to the Digital World, not to mention forge unbreakable bonds of friendship with sentient computer programs capable of materializing in the physical plane. Also, there is a important focus on relationships as much as world saving. Yu-Gi-Oh! has elements of this. Corrupt corporations and conspiracies? Check. Cyberspace? Check. Normal kids fighting evil? Check. While fighting consist of card games instead of high-tech action, the characterization and goals match. 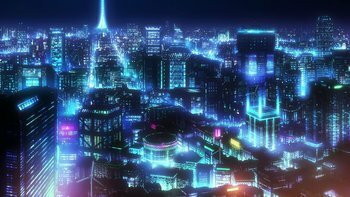 In Psycho-Pass the protagonists work for the system and technology has brought something close to utopia, but there are darker undertones in relation to how technology has affected humanity and the nature of the Sibyl System. Though A Certain Magical Index is more slanted in the direction of urban fantasy, spinoff series A Certain Scientific Railgun wears this trope as its central premise. The first season anime in particular toggles between being a slice of life series about the lives of young students living in a futuristic city and the plot which focuses on the social ramifications of said students being able to learn to have psychic powers. The Level Upper arc in particular is powered by the divisions between the haves and the have nots. Paprika, for the same reasons as Inception below. Transmetropolitan. While science has brought great wonders to humanity, humans are still the same old assholes. The most popular fast food franchise of the future serves cloned human meat. This key factor is what makes Transmetropolitan Post-Cyberpunk: the technology does not alienate people; people alienate people. The bizarre transgenic modifications actively help to bring about social good and fight the apathy choking the system. There's a good argument technology alienating people versus people alienating people has never been a feature of cyberpunk. The Surrogates isn't bleak enough to qualify as Cyber Punk and in the comic technology comes pretty close to solving all of society's problems, but even a society where (most) people can possess the perfect body and the worst crimes are damaging property has its own flaws. Wildcats 3.0. A huge Mega-Corp answerable to none buying out entire conglomerates, technological advances leading to social upheaval, and ineffective governments looking out for their own economic interests. All the elements of a Cyber Punk world, but with a twist; the Mega-Corp is entirely altruistic. Interestingly, most of the characters are very aware of the implications. Even the two people who know the Mega-Corp best wonder if a Mega-Corp can actually be anything but malicious. Although the late '90s had a string of sci-fi movies that dealt with the Platonic Cave idea and virtual reality, eXistenZ (which also contained aspects of Bio Punk) was perhaps the only one to present the virtual reality as a good thing. As for the Cave, well... let's just say transcendence is no better than existence. Inception. It has some of the hallmarks of cyberpunk — a burned-out protagonist and the powerful Japanese Corrupt Corporate Executive who hires him to brainwash a business rival — but the Japanese guy turns out to be not so bad and is actually trying to prevent a monopoly, the protagonist gets better (sort of), and the brainwashing plays out as Epiphany Therapy. Extraction/inception itself is simply a different take on hacking in Cyberspace, only with dreams instead of computers. Inception mostly achieves post-cyberpunk status by avoiding the '80s-influenced look of cyberpunk, not the story and feel thereof. In the 2014, RoboCop (2014) Remake OmniCorp and its parent company OCP isn't an almighty 1980's-style Mega-Corp, though the issue of automated drones, rising crime and Sinister Surveillance is touched on. On the other hand, Robocop is shown to be using many of those very same technologies for good. Minority Report. It's a gritty noir tale set in 2054, and though it deals with cyberpunk themes such as Big Brother Is Watching and Sinister Surveillance, its not a complete dystopia and everything is actually quite shiny and clean. Washington, D.C. has the lowest crime rates in the country thanks to the Pre-Crime Division. An essay by David Brin asserted that when spider-bots flushed into an apartment building to check people's eyes (in hopes of finding a pre-criminal), it was portrayed as a limited intrusion agreed to by the citizens, rather than an imposition from an unaccountable elite. Tad Williams's Otherland tetralogy, which shares much of the tone and content with .hack despite being set in the late 21st century. His novel Snow Crash, and to an extent, Cryptonomicon. Snow Crash especially straddles the line between Utopia and Dystopia and is usually considered the Trope Maker. To an even greater extent, The Diamond Age, which begins with a typical cyberpunk character, the two-bit cyborg criminal Bud, who gets arrested, tried, and executed before the actual story begins, to show that such characters have no place in this world. The novel is set in a near-future where technological advance has wiped away nation-states and radically altered the entire global economy  for most people, this turns out to be a good thing. Halting State and Rule 34 by Charles Stross both are 20 Minutes into the Future with a debatably amoral view of technology. The first part of Accelerando also fits (until the AI overlords turn the Solar system into computronium). Rapture Of The Nerds fits even more strongly, as it takes place in a world where The Singularity already happened a while ago, and while most people are unequivocally better off, they're mostly not actually very grown-up about it until the aliens show up and force humanity to prove it can live harmoniously with others and not overrun its natural-resource limits. Humanity just about passes the test. Ready Player One by Ernest Cline straddles between this and classic cyberpunk. IOI owns pretty much everything except the Oasis which lets people escape from their hellish reality. Wars, poverty, disease and climate change are rampant in the real world, so people spend as much time as possible inside the OASIS, which leads to it being abused so that it consumes your life. Then again, it allows the protagonist to meet his best friends throughout the book, it lets people be who they want to be, lets impoverished people get more opportunities, and ultimately helps give meaning to one's life. OASIS also gives such a huge, realistic universe to people for a single quarter, although it is an Allegedly Free Game. If IOI gets the egg, however, it'll become a clear-cut example of dystopian cyberpunk. The 1988 novel, Islands in the Net is one of the original Post-Cyberpunk works. Sterling tackles the problem of corporate power head on, envisaging Rizone, a highly networked multinational founded on "economic democracy." His two interlinked short stories, Maneki Neko and Bicycle Repairman, both published in his seminal collection meaningfully called Good Old-Fashioned Future, arguably do an even better job at it, due to being written more than a decade later, when his ideas became clearer. But then, Sterling has always been ''less'' bleak than most of the Cyber Punk authors. William Gibson's Bigend Books (trilogy?) moves the other Ur Cyber Punk author into this territory. Although, Spook Country (written against the background of The War on Terror) is on the bleaker end of the scale, just not dystopian. Allen White's Murderworld posits a mostly-functional American democracy, although one tainted by corporate influence, economic classism, and a societal propensity for simulated violence that spills over into the real world and its politics. Vernor Vinge's 1984 novel The Peace War has both dystopian and Utopian themes. The Peace Authority is a strange semi-Stalinist state; authoritarian, yet antipathetic towards any government outside their own small territories. They are challenged by a free-spirited "hacker" community, the Tinkers. In Neal Asher's The Polity novels, the protagonists are loyal to a benevolent autocratic government controlled by advanced artificial intelligence, and the universe is coming close to The Singularity. Essentially, the series takes the scope of Space Opera (with particular influence of The Culture), but gives it the gritty tone of Cyberpunk. Walter Jon Williams's more recent books (This Is Not A Game, Deep State) are definitely in this genre (of the Twenty Minutes In The Future variety). While Daemon by Daniel Suarez is a cyberpunk technothriller, its sequel, FreedomTM, deals with the establishment of a new social order in the aftermath of the first book's open class warfare. Matt Ruff's Sewer, Gas & Electric blends Post-Cyberpunk with a hefty dose of humor. Rudy Rucker's Postsingular jumps back and forth a bit, but ultimately ends on a post-cyberpunk note, with the characters fighting for freeware. Pat Cadigan's Dervish Is Digital about cops working in AR (Artificial or Alternate Reality) which is basically treated like a frontier in desperate need of taming. Richard Kadrey's Metrophage sits uneasily midway between Cyberpunk and Post-Cyberpunk - it was published relatively early in the cyberpunk era but was far more concerned with political and social issues than most of its contemporaries. The Cassandra Kresnov novels are post-cyberpunk with a Military Science-Fiction backdrop for flavor. The title character is an Artificial Human Super Soldier who works for Callay's planetary police after gaining political asylum there, and Tanusha is portrayed as a mostly happy cosmopolitan city of shiny skyscrapers instead of a dingy, crime-ridden place. Agent G by C.T. Phipps is a series about a cyborg assassin set Twenty Minutes In The Future and chronicles how the world goes from being our world into a typical Gibsonian dystopia. Notable for also drawing elements from Bladerunner and Total Recall (1990). A bit unusual in that it starts as a post-cyberpunk setting before falling apart to become a cyberpunk one. The Transhumanist Wager focuses on Jethro Knights, a Transhumanist philosopher who travels around the world by boat to spread the message about Transhumanism. He returns to what was the United States as Christian terrorists begin taking control of the government, turning it into The Theocracy and targeting all Transhumanists. This results in Mr. Knights creating a utopian floating city-state named 'Transhumania', designed to be free from governments that fear and hate radical science. Aeon 14 blends significant influence of post-cyberpunk into a Space Opera setting, with Artificial Intelligence, BrainComputer Interface, and Bio-Augmentation as major parts of the setting and portrayed neutrally (and sapient AIs almost always counted solidly among the good guys). The world overall looks quite similar to what we have now on Earth, except Recycled In Space. Babylon 5 dipped into this genre from time to time, especially in the first few seasons, with various things like the Changeling Netnote allowing one character to impersonate another, genetic, physical, and cybernetic modificationsnote trying to make better telepaths, adding such features as gills for breathing alien atmospheres, or turning people into assassins or walking recording devices, or worse..As the series continued and the Myth Arc took off, many (but not all) of these elements were overshadowed or quietly forgotten. Continuum, due to some of the technological benefits to everyone in the North American Union and that Kiera is trying to do her duties despite the NAU being under the rule of corporations. Person of Interest has the setup for a traditional Cyber Punk series but is post-cyberpunk in execution. The Machine is an Artificial Intelligence created for government surveillance of the entire world (ostensibly in order to prevent terrorist attacks or acts of treason, but the agency operating it, codenamed Northern Lights, has no problem killing innocents to keep the secret). However, Finch and Reese use it to prevent mundane violent crimes, taking down organized crime and Dirty Cops among other threats, and because Finch wanted to protect people's privacy as well as provide security, he deliberately hobbled the Machine so that it was a complete Black Box: all somebody on the outside gets is a Social Security number as a clue to lead them to the threat. Almost Human is this, because despite the rampart hi-tech crime, the good guys (a traumatized cop and his android partner) actually often save the day. There are also instances of hi-tech criminals genuinely repenting and corporations honestly cooperating with law enforcement. Machinae Supremacy has a lot of songs made of this trope. Fates Worse Than Death features a setting where cyber isn't quite as popular, and implants help, but don't turn you into a Chrome Champion. Corporations are powerful, but not omniscient, and guns are tightly controlled, leaving more space for switchblades. Above all, everyone has a place in society, including gang members! Actually, especially gang members, as gangs are less of crime groups and more of mutual protection societies when the government isn't willing to keep the order and safety (which is how many gangs started anyway in the real world, making this Older Than Feudalism). Free Market (based on Down and Out in the Magic Kingdom) is bright and shiny and just plain awesome about how future technology will be. It does really crank up the "humans will be humans" aspect with an entire social structure/economy based around how much people like you, similar to Facebook. Viva la adhocracy! The third edition of R. Talsorian's Cyberpunk RPG is set in a Post-cyberpunk world. The irony of a post-Cyberpunk game called "Cyberpunk" is not lost on anyone. These thematic changes are also what caused fans of the game's previous editions to react negatively to this one. The fact that the core book's artwork consisted entirely of Photoshopped images of posed action figures in ridiculous costumes didn't help, either. Transhuman Space is a post-cyberpunk setting for GURPS. Although the Broken Dreams sourcebook lends itself to a more classic cyberpunk feel. CthulhuTech is very much a post-cyberpunk setting, and despite the nature of the universe, has a government that despite its flaws is trying to save humanity, an economy which is approaching post-scarcity with nanofactories and the D-Engine, and themes of transhumanism (though not of the kind that you necessarily like). Shadowrun straddles this, having evolved along with the genre. The original 1989 game was a typical Cyber Punk dystopia, with evil megacorps running things. By the 4th edition, the corps are generally more neutral and there are far greater threats than them. While still dystopian, it's far less so than the earlier edition. 5th edition rolled things back, however; now the megacorps have re-tamed the Matrix and the game is about badass shadow mercenaries fighting corporate wars again. Sufficiently Advanced, a game almost entirely about how far flung future technologies effect society and how ideas change the world, has so much hope and wonder at what science can achieve that even the more disturbing cultures, like those that use meshes to make everyone a willing slave of everyone else, are able to sit down with the rest and have a civil discussion about why their way of life is the most moral and correct. The storylines of the Deus Ex franchise essentially explore the transition between cyberpunk and post-cyberpunk: individuals gain control of the technologies society uses to oppress them, and use them to change the world. Deus Ex is incredibly dystopian; disease and class war abound. But the heroic characters and their goals? So very much aimed at improving the existing system. The endings are pretty bleak, though; humanity is either controlled by a powerful AI as a benevolent world dictator, or controlled by a "democratic" group of rich old men, or not controlled at all by anyone but as a side-effect technology takes some dramatic steps back. Deus Ex: Invisible War is even more so; the previous game turned out to be a "Shaggy Dog" Story because all three endings happened - the uber-AI was born crippled, the Ancient Conspiracy returned to power, and the world was reduced to a series of high-tech enclaves in a ruined wasteland. But again, the heroic characters have the opportunity to change things for the better - and to decide what "better" is for themselves; give everyone enhancements and voting control over an AI overlord, resurrect the old democracies, get rid of all the crazy technology, or let the chaos give birth to Transhumans who will colonize the universe without fear. Deus Ex: Human Revolution actually has the conflict between cyberpunk and post-cyberpunk as its core plot element. The most idealistic faction wants to give augmentation to the masses in the hopes of creating a better world, while the old guard is stirring up fears of oppression and abuse to justify regulating the technology. But others want to rid the world of it altogether. Mega Man Battle Network takes place in an Everything Is Online world where Internet browsing is accomplished by using sentient programmes called Network Navigators (also known as Net Navis, or just Navis). While the world is generally bright and cheery and the protagonist and companions never stray into AntiHeroism, viruses, which serve as the game series' Mooks, are horrifically common and cyber-crime is a very real threat. Add all-encompassing Wi-Fi connectivity, angst, and aliens attracted to loneliness and you get Mega Man Star Force. Mega Man ZX takes place after the post apocalyptic Mega Man Zero, where humans and reploids live side by side and are rebuilding society a new. The Metal Gear series (with the exception of MGS3, which takes place in the 1960s) features a lot of post-cyberpunk themes and technology, and it becomes really strong with the introduction of the Patriots in MGS2. Mirror's Edge: Both the plots and the visuals are straight from the core concepts of the post-cyberpunk genre. Yet there's no technology that hasn't been around for years, and neither technology nor science play any part in the plot or gameplay. The game actually sits right on the edge (no pun intended) of old-school cyberpunk and post-cyberpunk with the main character Faith being a member of the underground who resist the oppressive and authoritarian government who tries to rescue her sister, who is a police officer working for the very same corrupt politicians. As a kind of minor twist in the later parts of the game most of the Runners realize that they are the only ones who still believe their world follows the conventions of cyberpunk, while everyone else has accepted that reality is much more like post-cyberpunk. With their feeble rebellion against the establishment being both futile and pointless, many chose to rejoin society rather than hiding from cops in air shafts all their life. The Caldari State in EVE Online is themed after Cyberpunk stories, but it's actually closer to Post-Cyberpunk in how it works. The society is controlled by megacorps, but the corporations aren't really evil, and while they compete amongst each other (sometimes violently) and often engage in questionable practices, they still stand united against any external threat to the State. The society is meritocratic, so people who work hard will get into good positions, and the average citizens have fairly comfortable and productive lives (but those that can't keep up with the system are pretty much screwed since there is no such thing as social security). System Shock 2. While the first System Shock was set in a rather standard cyberpunk world, with the villains being a Corrupt Corporate Executive and an evil insane AI, and the hero a hacker pressed into service after being caught by the Mega-Corp's security forces, the sequel is set some 40 years later. In the meanwhile, events of the first game caused a backlash against the corporations that led to the establishment of a quasi-socialist world government locked in a sort of a cold war with the remnants of MegaCorps. While the plot of the game is mostly removed from politics, they make an impact on the story at several points. In Invisible Apartment, the setting probably leans more this way than towards traditional cyberpunk. On the one hand, it's highly regulated and involves powerful people covertly using technology for their own interests. On the other hand, people who aren't on the government's wanted lists don't seem to have as bad as a typical cyberpunk dystopia, and there are people on the inside who try to do the right thing. Watch_Dogs 2 is set in sunnynote but also appropriately foggy San Francisco and the technology is used by the heroes and villains to achieve their own ends. Ninja Pizza Girl follows the tropes of Cyber Punk but breaks with tradition by being, for the most parts, quite upbeat and optimistic. Living in an overgrown, rain-soaked maze of a city dominated by soulless megacorporations has not ruined people's ability to stay cheerful and care for their friends and family. Or to enjoy a really great pizza, for that matter. Questionable Content. On the surface, it looks like a story about a group of friends just going about their daily lives and being snarky. And then you see the AnthroPCs, which are basically robots that function as pets and home computers, although it's not always clear just how that's supposed to work. The AnthroPC characters run the range from Cute Machines and Robot Girl to Eating Machine and at least one Killer Robot. There is even a chart showing the Mechanical Evolution of the setting. Leaving the Cradle appears to be this In Space. Chaos Fighters II-Cyberion Strike and Chaos Fighters: Cyber Assault-The Secret Programs. However, the guardians (similar to Navis in Mega Man Battle Network) are originally designed as virtual humans, but due to crimes the research project switched its focus to develop fight able guardians so that the crimes can be solved quickly. H+ setting is implying to be this before human civilization crashes due of virus infected a Nano-cybernetic implant that nearly whole human population wearing it. Synergy from original Jem had a Ur-Example of Punk with its aesthetic and advanced technology of how projects itself with a more nicely and useful personality than other Als from Cyberpunk in that time. Despite seemly Cyberpunk themed Paris, France, Code Lyoko and it's live action sequel Code Lyoko: Evolution share an Post Cyberpunk-ish style (In terms of technology and fashion) due show actually set in mid-Turn of the Millennium and there were majority of episodes that set in lightly rainy day/night all of the time.